Located in the State of New York in the USA, the American Falls and the Rainbow Bridge show off their beauty during the nightly illumination display. 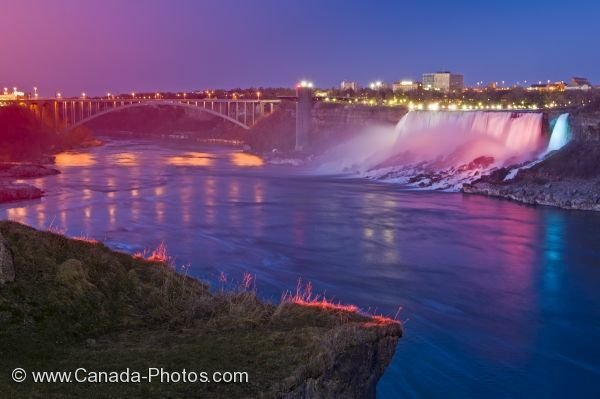 Standing on the Canadian side of the Niagara River in Ontario, Canada, visitors can view the colorful display of the American Falls and the Rainbow Bridge in New York State in the USA during their nightly illumination. As the water swirls towards the Rainbow Bridge, the colorful lights reflect across the surface of the Niagara River. The buildings in the backdrop behind the American Falls in the State of New York are also illuminated during the night time hours. The American Falls drop off 56 metres into the river but the basin below the waterfall is fairly shallow due to the eroded bedrock which has fallen from the steep slope. The steel arched Rainbow Bridge which crosses over the Niagara River connects the cities of Niagara Falls, New York in the USA to the east and Niagara Falls in Ontario, Canada to the west. Picture of the American Falls in the State of New York in the USA during their nightly illumination show. American Falls (located in the State of New York, USA) and the Rainbow Bridge seen from the Canadian side of the Niagara River during the nightly Falls Illumination, Niagara Falls, Ontario, Canada.